New wedding sets are being added to the website, starting on Page 2 of our Wedding Section. 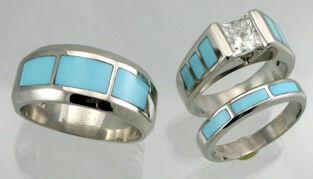 If you're looking for rings that will be unique and to your own personal taste, be sure to take a look. Jim loves to work with couples to design and create special rings, bands, and sets that nobody else has, so if that sounds like what you're looking for, don't hesitate to contact him! Many of the prices shown here are outdated as it's been impossible to keep up with the changing cost of gold and silver. Please inquire for current prices of particular pieces. To see if Jim will be coming to your city this year, be sure to check out his Show Schedule. I will be updating it as new shows are confirmed. If you have any questions, or would just like to say hi, you will find all of Jim's contact information on the Contact James page of this website. 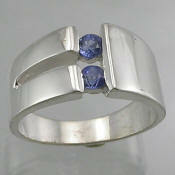 We're excited to now have a Silver Jewelry Section. 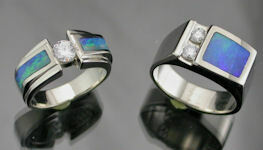 This is a small sample of the silver pieces Jim makes. Remember, almost any piece you see here, can be made in sterling silver, yellow gold, white, gold, rose gold, and even platinum. I'll be adding more pictures and listings this year. Your inquiries are always welcome! Shopping for unique matching wedding sets? 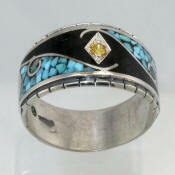 Jim combines his signature inlay with diamonds and other gemstones for designs that you won't find in any mall! He loves to make custom wedding rings and sets, so if you can't find that perfect ring, give us a chance to work with you. Look Here!! ♦ PLEASE NOTE: ♦ The cost of gold and silver is still fluctuating almost every day. I have recently updated many prices, but it's been impossible to keep up. For this reason, some of the prices on this website are not current, so please contact us for a price quote if you find something you are interested in purchasing. Please click here for updated pricing information.